"I realized there’s this ideology behind 'nerdism' that is the life blood of our pop culture. I wanted to start a website that was about something that was bigger than me but talked about the things I loved that was part of this movement that was already happening." But by that token, while nerds have true passion for the ideas represented in current pop culture, show business at times can't get past giggling at the geeks. "I'd like to believe that network television could do something like [the YouTube show 'Tabletop'] justice, but I'm not convinced that Hollywood is ready to do something like this that isn't all, 'LOL NERDS!' " Wil Wheaton said. Wheaton, well-known to nerds for his turn as Wesley Crusher on "Star Trek: The Next Generation," and recently on shows such as "Eureka" and "The Big Bang Theory," launched "Tabletop" on Day's "Geek & Sundry" channel, on Monday. He describes the show, which he hosts and executive produces, as a sort of "Celebrity Poker Showdown" for role-playing games. "One of my ulterior motives with 'Tabletop' is to show, by example, that getting together with friends to play a tabletop game like Dixit is just as normal and fun as getting together for a movie, or to watch the Sportsball Contest, or to play poker or even a game like Sorry or Yahtzee," he said. "I want geeks who, like me, are in a mixed marriage with a muggle, to sit down with their spouse or partner and say, 'Watch! This is why I love to play these games!' "
Despite offers to do more extensive programming for television, Day chose to develop a YouTube channel because, "when I looked at the choice between [TV] and starting my own network, in a way, I just couldn’t pick the easier route," she said. She saw the possibility to create a community online around the shows more enticing. According to Veronica Belmont, one of Day's "Geek & Sundry" partners in crime, "We like to take the road less traveled, I think." "We're not very used to depending on people to make stuff happen for us. Web video and podcasting have always been that way!" The co-host of Belmont's science fiction/fantasy literature podcast "Sword and Laser", Tom Merritt, agrees. "Passionate folks created thousands of newsgroups on Usenet in the early 1990s. This is the same impulse, but we just have better and better tools with which to do it," he said. And this may be at the heart of what separates "The Nerdist" and "Geek & Sundry" from broadcast television shows jumping on the geek bandwagon. Hardwick is a firm supporter of the idea that nerds should and do evolve from the stereotypes that can come across in mass media. "Digital culture has really helped to flourish the idea of creative nerds. The nerdist movement is less about consumers; there is a large contingent that are creative nerdists instead of consumers," Hardwick said. Nerdist Industries CEO Peter Levin explained why he and Hardwick - already known to television viewers for his BBC America specials, his appearances on G4's "Attack of the Show" and his hosting gig on AMC's "Talking Dead" - decided to go to YouTube. Even though cable TV is in the midst of a "'second golden age,'" according to Levin, "we really felt there is no home for the breadth of this type of content that we’d love to both see and produce" in the traditional broadcast landscape. At the same time, Levin and Hardwick saw it as a chance to work with people they've always wanted to work with: “For guys like Chris and I, it’s a reality check when you wake up and realize you’re doing a show with [astrophysicist] Neil deGrasse Tyson." Hardwick calls himself a "process nerd", obsessed with "the whole 'how-is-it-made' kind of thing." “I identify myself as a nerd. My best friend, Wil Wheaton, identifies himself as a geek," he said. "[We're ultimately talking] about the same thing." 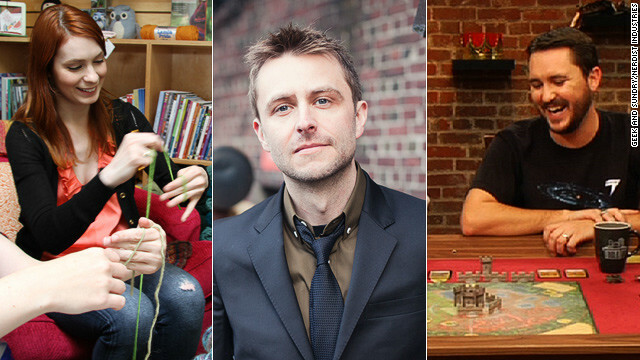 In fact, Hardwick will appear on "Tabletop," and he sees no competition with Geek & Sundry. Day agrees. “It’s definitely not a situation of either-or. It’s a situation of ‘let’s both make as [much] awesome stuff as we can,’ " she said. "I think of it more as being niche content rather than purely 'geek' content," said Belmont. "We're serving very specialized, passionate (and often underserved) audiences on a number topics." "I don’t think anybody adheres to a label very well," said Day. "I want people to know that, yes, if you’re a geek, you’re probably going to identify with all of these shows. Bottom line: nobody’s confined to these stereotypes. In order to expand who you are and embrace everybody – that’s why the community is so important to 'Geek & Sundry.' "
Hi there, I found your blog by the use of Google at the same time as searching for a comparable matter, your site came up, it seems to be great. I've bookmarked to favourites|added to my bookmarks. I have to say that for the past couple of hours i have been hooked by the impressive posts on this blog. Keep up the great work. Attractive element of content. I just stumbled upon your web site and in accession capital to claim that I get in fact loved account your weblog posts. Any way I will be subscribing on your augment or even I achievement you get entry to constantly fast. Hello there, simply become alert to your weblog thru Google, and found that it's truly informative. I am going to watch out for brussels. I’ll be grateful when you continue this in future. Many folks might be benefited from your writing. Cheers! Thanks for the tip for us Zune users (I listened on my Desktop). Take care you two I'm rellay enjoying your return to PodCasting. I've been listening since you were on Planet Xbox. I especially enjoy the family stuff we're in sync with the kiddies my daughter was born in 2006 and my son three weeks ago! It’s called …our careers are going nowhere so we have nowhere else to go. I was suggested this blog by way of my cousin. I'm now not certain whether this put up is written by way of him as nobody else understand such distinctive approximately my trouble. You're wonderful! Thanks! Once again an awesome idea. Way to go Whil. Is there any way to send you games to try out on your show? I am gonna have to track the show down. Great points altogether, you just gained a new reader. What could you recommend in regards to your publish that you just made a few days ago? Any sure? Hi there, simply changed into aware of your blog via Google, and located that it is truly informative. I am gonna watch out for brussels. I will appreciate for those who continue this in future. Lots of people will probably be benefited out of your writing. Cheers! Jeri Ellsworth is 10x hotter than Felicia Day! And Jeri is a real chip designer, a real nerd! She doesn't just play one on TV. Excellent web site. Plenty of useful info here. I am sending it to some pals ans also sharing in delicious. And obviously, thanks in your sweat! Hello, Neat post. There's an issue with your website in internet explorer, could test this? IE still is the market leader and a huge component to other people will miss your great writing because of this problem. Tremendous issues here. I am very glad to peer your article. Thanks a lot and I'm having a look ahead to touch you. Will you please drop me a e-mail? Pretty section of content. I simply stumbled upon your web site and in accession capital to assert that I acquire actually enjoyed account your blog posts. Any way I will be subscribing on your feeds or even I success you get right of entry to constantly fast. So tired of hearing "geeks" making things "nerdier". It would be offensive if I said black people were making things "blacker" but "nerdier" is ok, because it's universally acceptable to make fun of nerds for no reason at all. All nerds have unusually wide urethræ? Hi Todd, Whatever happened to the 41411 GGWIND text meassge system? It jsut returns a blank meassge. This was the BEST thing ever. Sailing out of sausalito, I never know what sails to put up on our yankee dolphin 24 so the text meassge was a godsend. Any chance you'll bring it back to life? My husband is a nerd and we're both proud of it. It's not offensive when nerds or geeks call themselves nerds and geeks; it's just true. "...cable TV is in the midst of a "'second golden age,'" according to Levin"
Really? The way I see it, cable tv is dying a slow death. You pay hundreds of dollars a year, maybe even thousands, and get a whole bunch of stuff you never use. You get less content (used to be shows had 22-25 episodes a year, many now only have 18-20), more commercials (typically around 15 minutes per hour), and dozens if not hundreds of channels you'll never even watch. Meanwhile, services like iTunes, Amazon VOD, Hulu, Netflix, etc. allow you to pay just for what you want to watch, and see your favorite shows whenever you want to, at a heck of a lot cheaper than cable. Eventually, it will get to the point where cable tv will have to either evolve or die out. I haven't had cable for nearly a year. I still enjoy my favorite shows, legally (not downloaded off some torrent site or other pirated media – I pay for every show I watch), and I save about 80$ a month. Although I see your point, I think Levin is just pointing to the fact that for the first time in a while, the best shows are coming from cable rather than network television. You have AMC featuring Emmy-winning shows like "Mad Men" and "Breaking Bad" along with a very strong "The Walking Dead". FX has "Always Sunny" "The League" and "Justified". And in my opinion, the USA programming has been pretty strong (but declining) the past few years with "Psych" "Suits" and "Burn Notice". You save $80 a month? I don't even spend 60% of what you "save" for TV. Buying ala carte is fine and cutting the cable is great, but don't expect for cable/Dish/etc... to disappear and everything will be available on line. Until they can extract the same revenue dollars (Subscriptions and Advertising) things will become harder to find online and with more commercial content. Stop Paying Everyone Else For The Information I'm Going To Give You For Free! Who else wants Money Rolling Into Your Bank Account.